The difficulty in making clear fire origin and cause determinations can be compounded when dealing with non-standard fuel loads. The term fuel load is defined as: “The total quantity of combustible contents of a building, space, or fire area, including interior finish and trim, expressed in heat units or the equivalent weight in wood” (NFPA 921, 2017, 3.3.93). 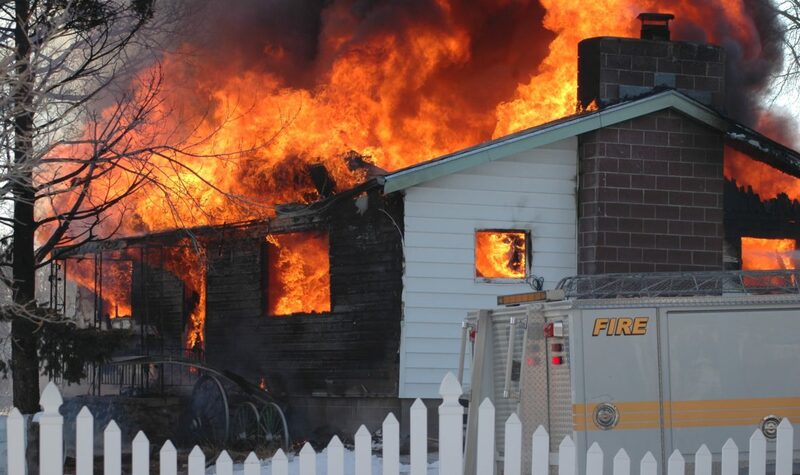 Adding to the complexity of the fire scene is the fact that not all structures offer the same fuel load to the fire. Below we offer three short case studies that show the importance of understanding fuel load in making origin and cause determinations. Fire investigators are familiar with the concept that heavily furnished homes burn differently than a sparsely furnished home. A heavily furnished home provides large amounts of fuel, and if given the time will result in heavier damage to the structure as well as provide a myriad of fire patterns for which to account. A sparsely furnished home will generally burn less vigorously and may have fewer fire patterns through which to navigate. The two homes were both log cabin-style homes. The one on the left was a regularly lived-in home with all of the typical furnishings expected of such a structure. It was furnished with beds, linens, sofas, chairs, dining table, end tables, clothing, toys, cabinets, etc. The home on the right was a rental cabin with only the bare essentials provided therein. It was furnished with a bed, two sofa chairs, two small tables and a dining table with chairs. There was little else inside that would have provided much in the way of fuel for the fire. Although both homes were a total loss, the home on the left underwent heavy structural failure due to the fire whereas the home on the right experienced much less structural damage. Both homes burned for approximately the same amount of time. In this case study it is important to know the fuel load, as it will help explain the fire patterns left behind. The fire patterns left on the home on the left were complicated and often contradicting. The fire patterns on the home on the right were clear and generally non-conflicting in nature. An egg processing and packaging factory caught fire resulting in heavy damage to one of the large coolers and attached shipping docks. The structure was of steel construction with concrete floors. The interior of the affected cooler was heavily damaged. The exterior of the structure appeared to be generally unaffected except for a few tell-tale fire patterns around a few vents and some of the eaves. The contents of the structure, for all intents and purposes, provided little in the way of fuel for the fire. Nearly everything inside was of metal construction – egg racks, shelving, machinery and the like. The interior walls, however, were of plywood construction. Hiding behind the plywood was approximately four inches of polystyrene and cellulose insulation. No plausible ignition source inside the structure could be identified. Investigators turned to the exterior of the structure for an explanation. At the time of the fire there was some HVAC hot work being done on the exterior wall of the cooler. An HVAC outfit had been contracted to retrofit an outdated refrigeration system with a larger updated unit. They were brazing copper pipes along the west wall of the structure prior to the fire. Unbeknownst to the HVAC workers, the exterior metal wall was only inches away from the polystyrene insulation panels. These panels quickly melted onto the cellulose insulation creating a wicking effect, essentially lighting a candle inside the walls of the structure. The fire burned inside the walls and then licked up onto the ceiling of the insulated cooler. The above image shows the affected cooler and the attached shipping dock. 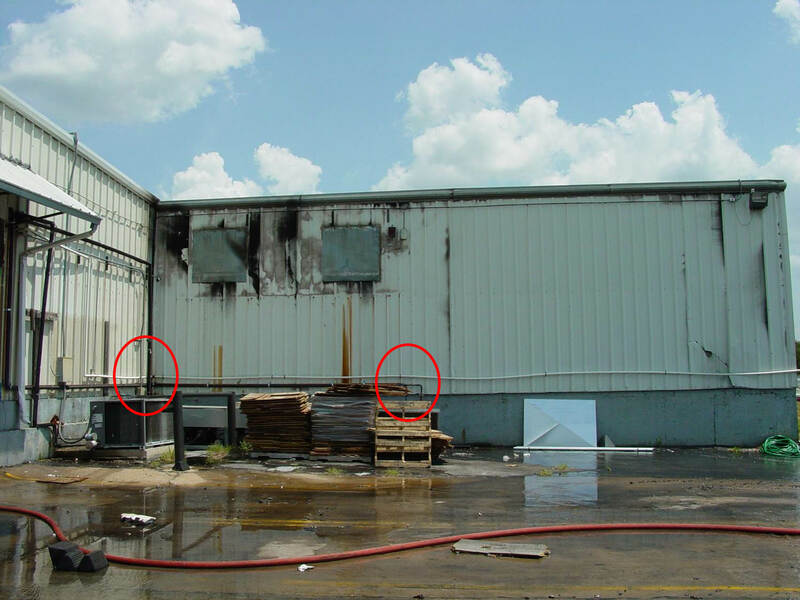 The red circles indicate where the HVAC hot work was being conducted on the exterior of the structure. 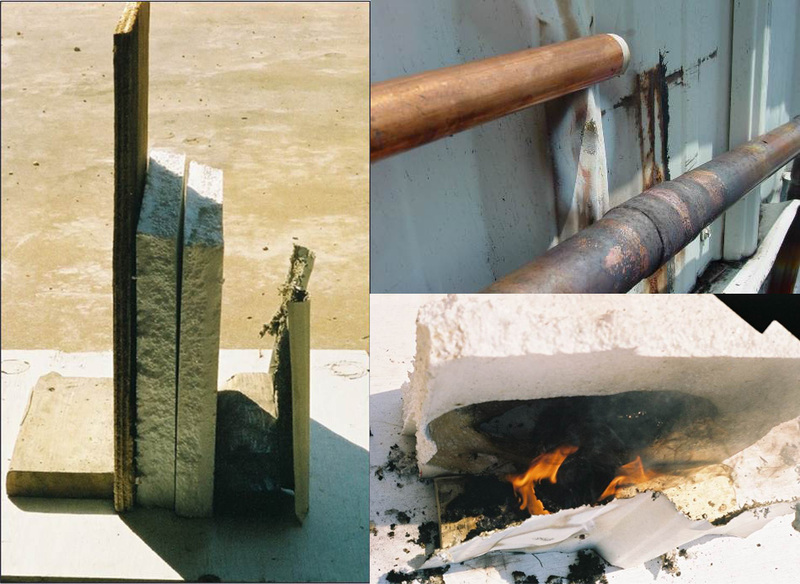 The above images show the evidence of the hot work along the cooler exterior wall, a mock-up of the subject wall, and testing we conducted resulting in flaming combustion. The origin was determined to be along the exterior west wall; the cause was determined to be open flame brazing of copper pipes along the exterior wall melting the polystyrene insulation onto the nearby cellulose insulation and then igniting. 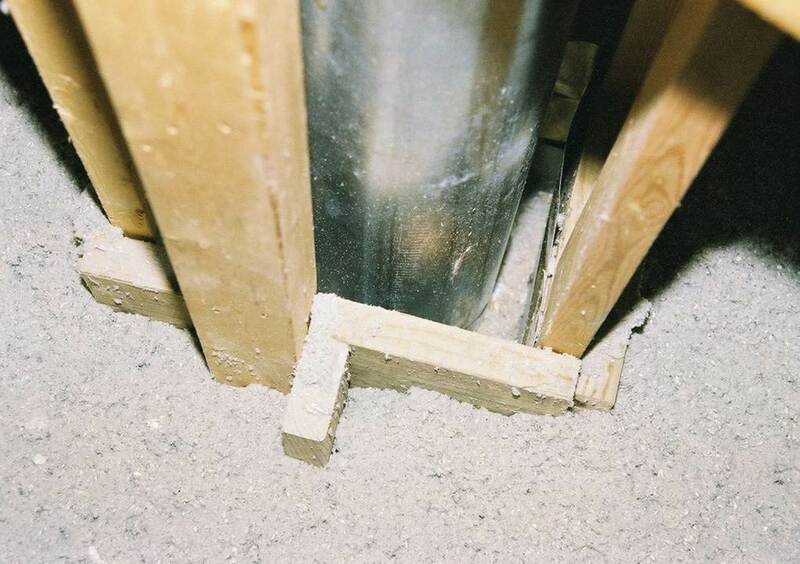 Had the HVAC workers been privy to the wall design they might have altered their brazing procedure that day. A costly fire could have been avoided. Two homes of similar construction burned due to improper construction of a fireplace chimney system. Both homes utilized a metal double-walled flue that passed through the ceiling and attic and then exited the structure through the roof. 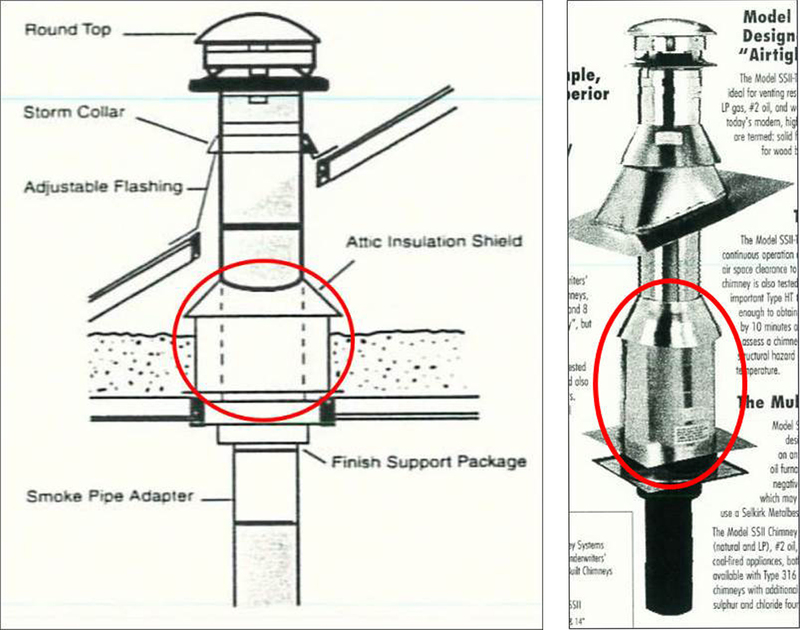 As the metal flue transitions from living space to attic space there is supposed to be a component installed called an Attic Insulation Shield (AIS) that separates the flue pipe from insulation and other combustibles and provides a necessary airspace. In both of these homes, the AIS was not installed. As a result, the flue pipe was denied the necessary airspace which resulted in overheating. A new fuel load was presented that otherwise would not have been available. Combustibles, namely wood framing members and insulation, were then subject to pyrolization and eventually ignition. The above images show the AIS component as it is designed to be installed. The above image shows the rebuild of one of the homes, also lacking the appropriate AIS. Had the installers utilized the proper components and installed them correctly in both instances, the fires could have been avoided. It is important to note the fuel load of a structure when conducting origin and cause investigations. 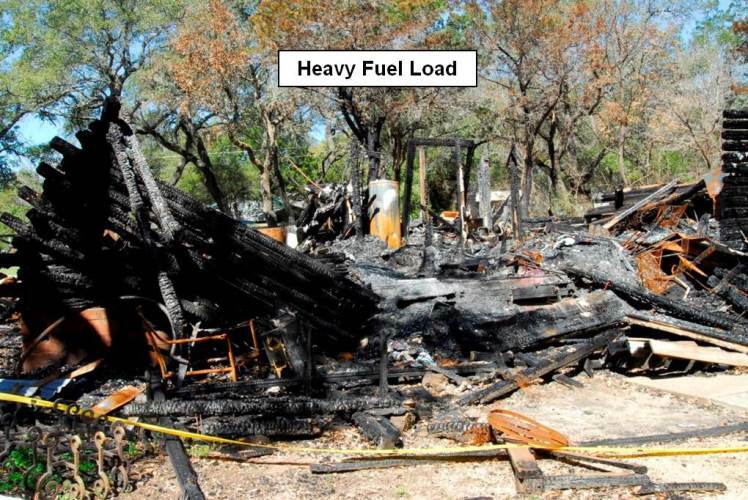 A heavy fuel load will affect a structure much differently than a light fuel load. The design of a structure may play a large role in the available fuel load. 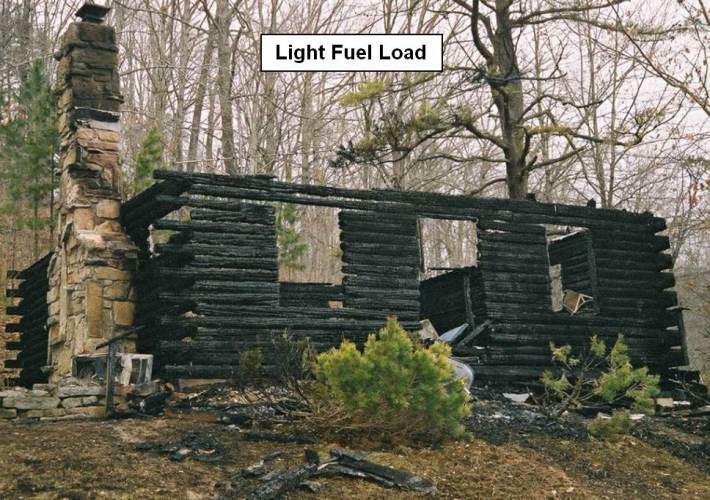 Contents, including hidden fuel loads, can greatly alter the progress and intensity of a fire, providing fuel in areas that otherwise may have been left generally unscathed. These hidden fuel loads can lead to a more vigorous fire and potentially confound the fire patterns left behind. Understanding building and mechanical system design greatly assists the investigator in coming to an appropriate and competent origin and cause determination. To find out more about how Ponderosa Associates can assist in fire origin and cause, please visit our Fire & Explosions consulting service page or contact us.